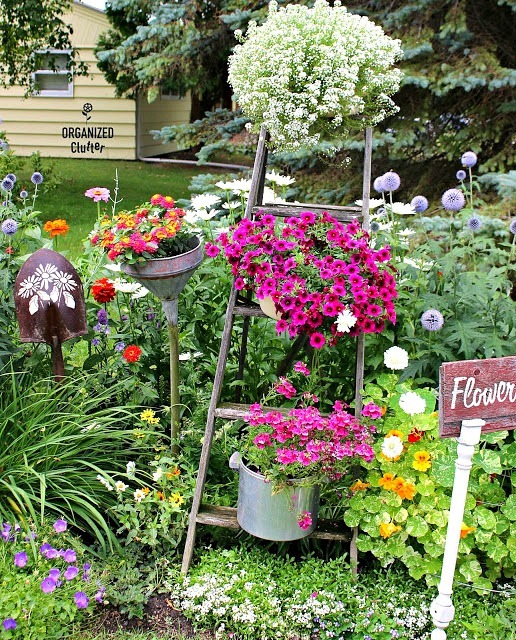 I have been adding ladders to my flower gardens for years! 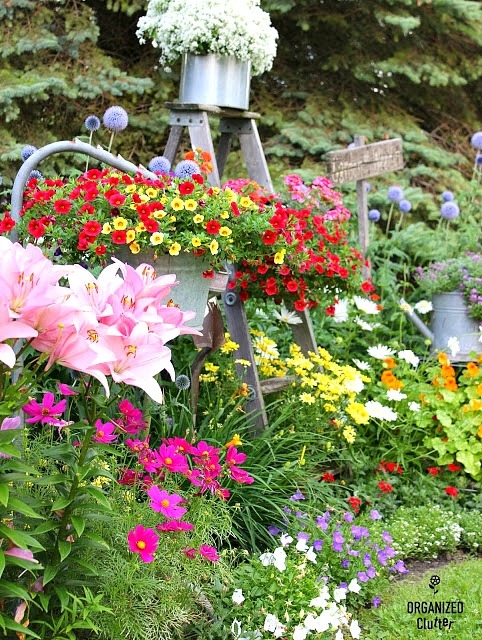 My advice for adding vertical interest to a flower garden is to use tall perennials in the back and adding a stepladder of container gardens. At planting time, it doesn't look like a very good idea. In fact, it looks pretty junky! But after a few weeks, when the plants start to fill in, you will see there is a method to the madness. I have used various containers, mostly terracotta pots and pots and pans. I usually choose trailing or semi-trailing annuals in the pots. Like in the top pot here, a Calibrachoa. 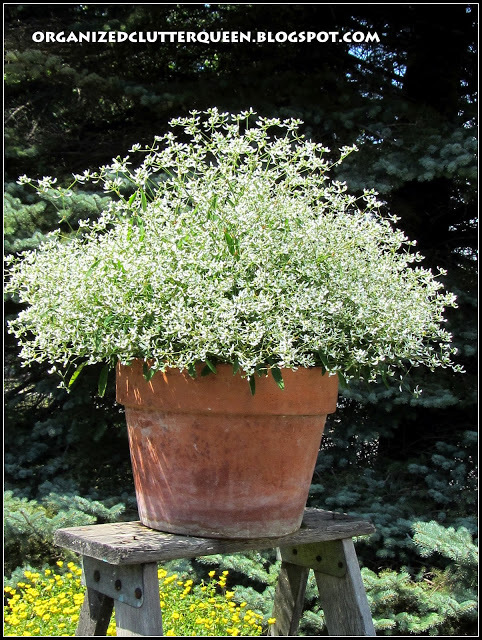 Annual phlox are another good choice for a step ladder container. 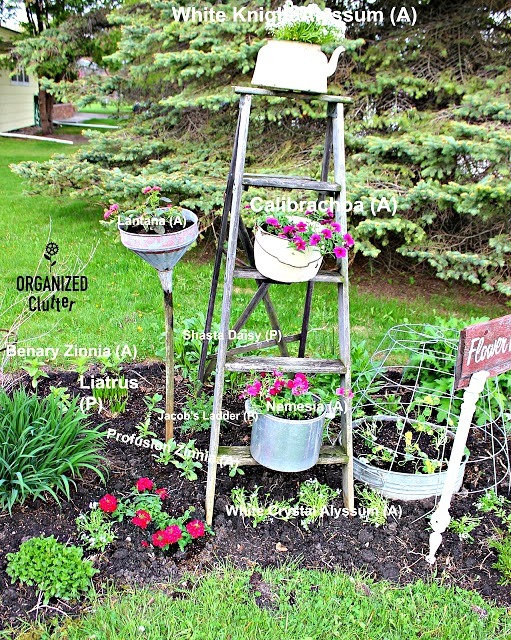 I put a plant on every other rung, so garden junk on the remaining rungs adds to the fun! Do the pots every blow or fall off the ladder? No. The top of the ladder and two of the rungs have large machine screws or bolts through the bottoms of the rungs so that a corresponding hole drilled in the pot slides over it. The pots NEVER slip or blow off. 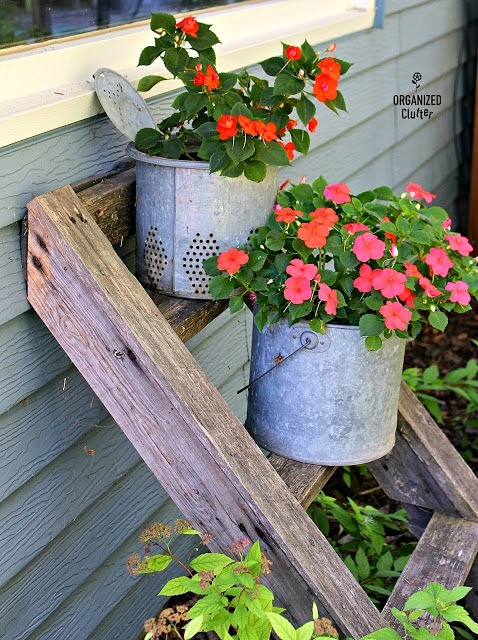 Terracotta pots work well on the ladder, but terracotta dries out much faster! This season I used a spiky Angelonia plant on the bottom rung. Here is a Mercadona Golden Dust on the ladder. Another great choice is a Diamond Frost Euphorbia. The border coming into bloom. The border in full summer bloom. 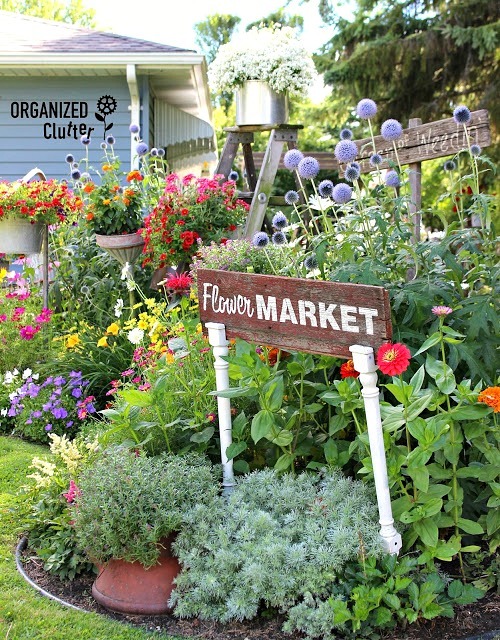 Freestanding signs also add vertical interest to the flower garden. 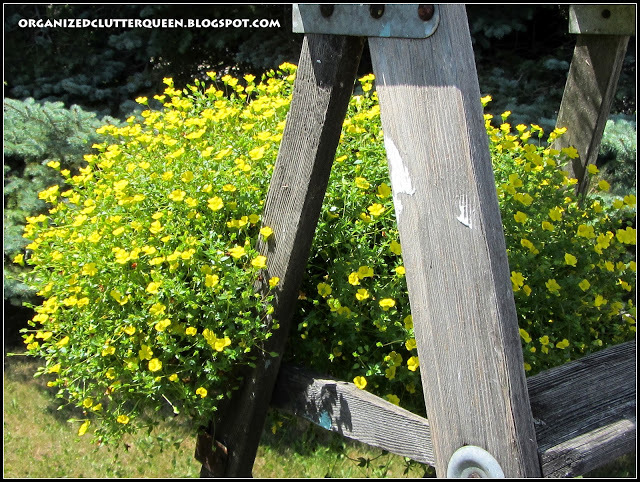 I love my weathered stepladder. To preserve it's life, I treat it with Thompson's Water Seal. This ladder propped up against my house is an old tree house ladder. This shady space is perfect for colorful impatiens in teapots. Or colorful impatiens in terracotta pots. Or in metal minnow buckets. 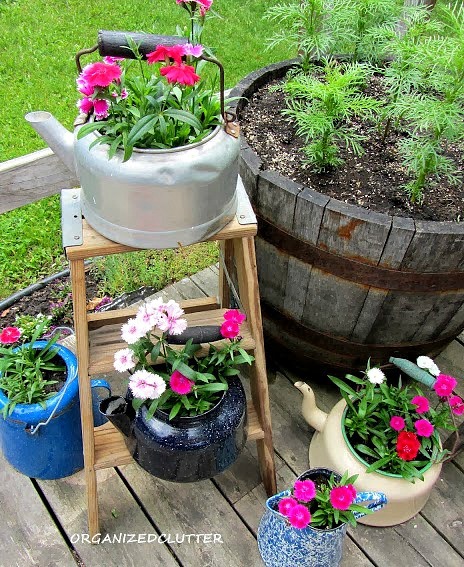 Teapots of annuals on a small stepladder on the deck. 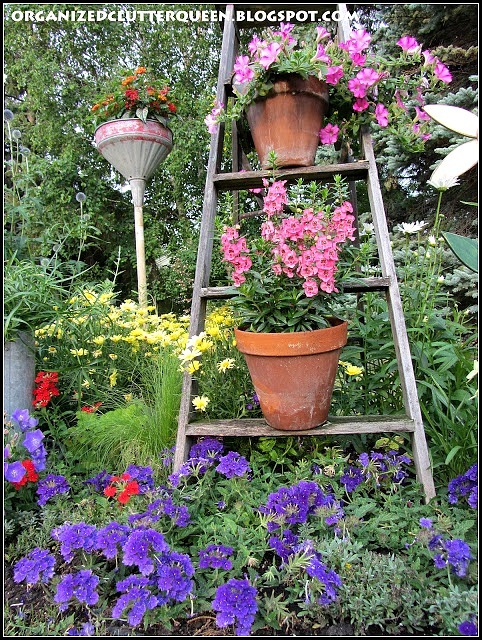 A ladder as a backdrop to annuals in a container. My friend Dana has an old playground slide ladder! Fun! My friend Danita, attached her pot to the ladder and leaned it up against her house. 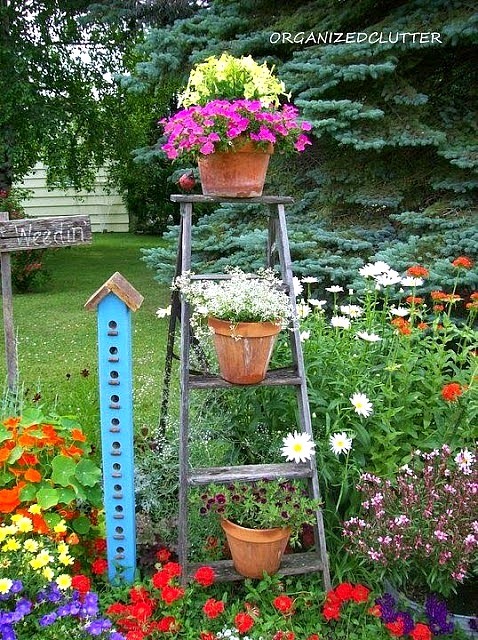 Have I convinced you to add a ladder to your flower garden yet? 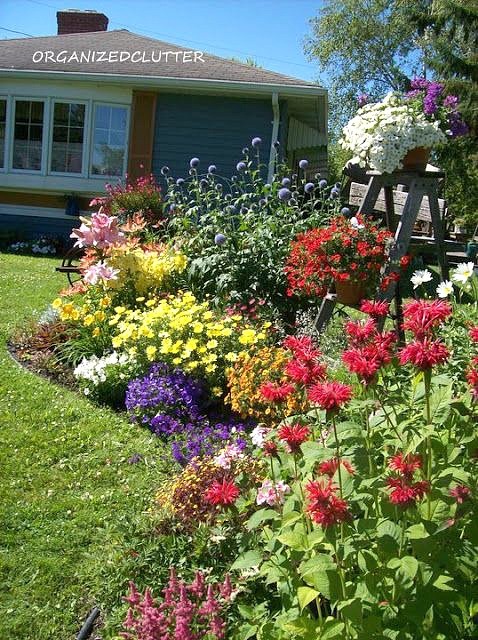 I love the height, and levels of color, the ladders add to your beautiful gardens, Carlene! Pinning!